The choroidal neovascularisation (CNV) model in rat represents an equivalent animal disease model in pathology to Age-related Macular Degeneration (AMD). A break of the subretinal located Bruchs’ membrane is induced via laser surgery. The lesion induction is associated with the development of ocular neo-vascularisation. Blood vessel proliferation as well as suppression is influenced by anti-VEGF (Vascular Endothelial Growth Factor) or PEDF (Pigment Epithelium Derived Factor) protein application (Fig. 2). Fig. 2: CNV Induction. (A) Brown Norway Rat; (B) laser treated rat eye; (C) spots visualise the lesions of the rat eye’s Bruch’s membrane, which will cause and promote neovascularisation. Fig. 3: Demonstration of the CNV Animal Approach in Analogy to the Prospective Clinical Trial Surgery. (A) Pre-cultured pigment epithelial cells will be transfected with the Sleeping Beauty transposon system. (B) After pre-culturing, transfection and efficiency analysis of primary cells will be subretinally transplanted in CNV disease model and healthy rat control model. (C ) Animals will be controlled concerning disease progress by fluorescence angiography in a well-defined schedule. Biochemical and histological analysis of treated tissue will follow. 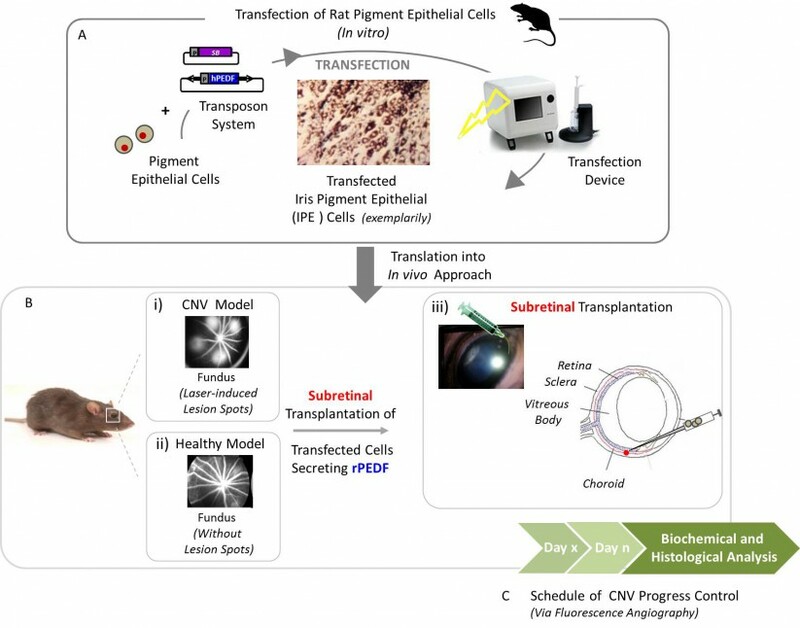 An animal model was tested to examine the therapeutic effect, and side effects, if any, of the gene modified pigment epithelial cells, transplanted subretinal within the TargetAMD gene therapeutic approach (by partner interaction see Fig. 1). Pre-cultured and transfected genetically modified RPE (Retinal Pigment Epithelial) or IPE (Iris Pigment Epithelial) rat cells were transplanted in various cell doses subretinally in healthy animals and individuals representing the CNV animal model. All animals (Brown-Norway rats) were treated and examined under GLP conditions following the institutional guidelines for the protection and welfare of animals. A detailed analysis of ocular tissue of the healthy rats was used to determine the two most efficient cell doses (in terms of PEDF secretion). These two doses were used in the CNV model to evaluate the efficacy of treatment in a disease model. After a follow-up of 21 days the protein levels of PEDF and VEGF were measured in the eyes of the laser-treated animals as well as the mRNA was extracted and quantitative RT-PCR was performed to evaluate long-term gene expression in the transplantation area. Possible inflammatory effects were evaluated by immunohistochemistry (Fig. 3). 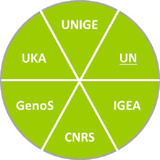 Results are translated in the experimental set-up of work package 6 to validate the gene transfer system of the Gene Therapy Medicinal Product (GTMP) by in vitro and in vivo assessment of the integration profile of the vector and in vivo biodistribution analyses.